In last months I was experimenting quite a lot with fermentation process. This bread is the result of latest experiment where I am testing the procedure how to get really well open crumb. Basically this is the amended Tartine country loaf recipe which starts with the true autolyse (just flour+water) for several hours, continues with adding starter, one hour resting period, adding salt plus additional water (double hydration), followed by at least 6-8 stretch & folds at about 30 minutes intervals during the bulk fermentation. At the end of bulk fermentation the dough is chilled in the fridge for 6-8 hours, then shaped cold and final proof is done on the bench. The starting baking temperature is about 260-270 going down to normal temperatures after first 8-10 minutes. The overall hydration in this particular case was about 85% and the white flour protein content was above 13%. The dough was hand mixed. I had similar results with flours with substantially lower protein content - only 9.3%. The outlook of this bread is similar to famous "crystal bread" although this bread is not made according to that recipe and the hydration is much lower. ...the competition for the Bread with the Fewest Calories Per Cubic Centimeter is... Joze! I think you are way too kind - it is not so airy as I have seen already sometimes. But as it is quite a "normal" recipe with not so high hydration I must say that I am really happy with it. Tom, you made me lough! It will make a wonderful dipping bread! Well done! You have some serious skill! I have joined TFL about 2 years ago and I got so much knowledge here. One can read books but asking questions and entering the debate here was the key benefit. Baking is like any other hobby or profession and requires a lot of devotion and time. But the theory is jut one part, the practice is even more important. Luckily I have opportunity to bake almost every day for my grandchildren and that gives me a lot of place to improve the skills and thinking about the fermentation process. But I am only at the beginning and I am aware of my limited knowledge. that is a jaw droppingly amazing crumb! You are took kind Leslie! As I already wrote in other answers I have learned so much from you all on TFL that this is the result of many hints I got here. It has an air of being only found in dreams! Excellent work! If you search trough internet for "pan de cristal" you will find many much better examples. But as this is just a normal sourdough bread with 85% hydration I am quite happy with it. baker Claude Perrando and your bread looks so much like his!!!! I know Claudio Perrando and I had done several times "crystal bread" but this is quite different recipe - actually like any other sourdough bread with no poolish. Also the hydration is much lower and this makes this bread easier to make. It was hand mixed while for crystal bread you need a good mixer and at least 95% hydration, better 100% and plus. The key factor is fermentation which makes dough enough extensible to get so open crumb. For crystal bread you use high hydration to get more extensible bread and it is mainly made with over-ripen poolish. So the prerequisites for open crumb are the same different is just the method how you achieve this. Your bread looks beautiful! The bubbliture is like some cool sci-fi fungi, I love it. What I love most about the loaf (and the 50/50 baguettes you referred to recently in the "Community Bake" thread) is the color and translucence of the crumb. I am imagining a wonderful chewy flavor in that crumb. How do you make that happen? And, are you willing to share the recipe? I noticed that your 50/50 baguettes were the only 50/50 loaves in the thread with the translucent crumb, what are you doing differently? Do you have a steam oven? "final proof is done on the bench"
My apologies... I kept referring to your 50/50 Maurizio as Baguettes. I got a bit confused, nonetheless, yours had that same glossy translucent crumb as this Tartine style bread. I would love to replicate that. First I must apologize for so late response! "final proof is done on the bench" - it means that I was proofing at the room temperature. I could express myself better, sorry for that. The recipe is actually no secrete and there is really not a "magic" step, that would guarantee the translucence of the crumb. First of all I found for the flours I am baking with that a longer autolyse helps to add more extensibility to the dough and thus get kind of a better ratio between the dough tenacity and extensibility. So finding the right time is matter of experiment. Secondly I usually use starter from fridge which was prepared a day before and when it peeked I put it int he fridge for at least 6 hours. I am pushing up the hydration but only as much as the flour can support. Sometimes it is better to have longer autolyse than adding more water but the final effect will be similar - the dough will be weaker. I prolongate the bulk phase in the fridge and shape cold dough. 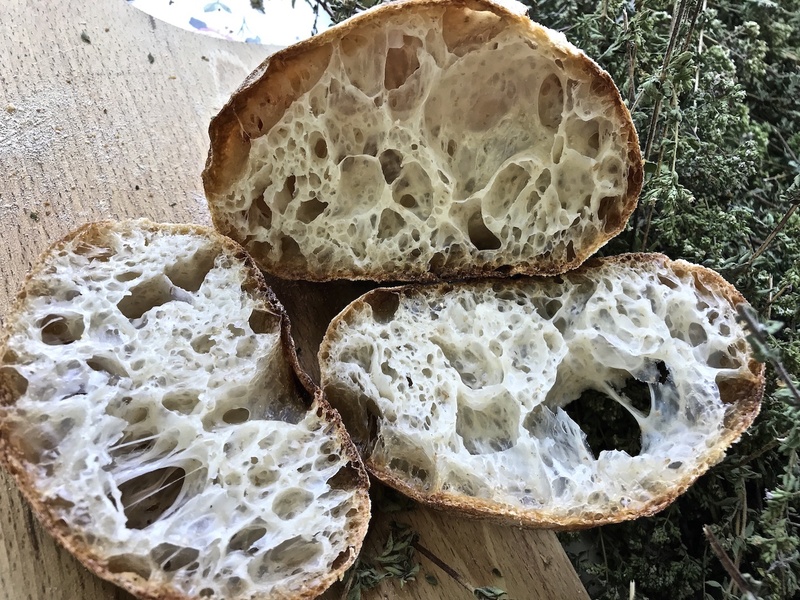 Shaping small battards or ciabattas enables you to "heat" faster your loaf what will result in bigger oven spring and when dough is well fermented also in a translucent crumb. Of course your loaf has to be proofed enough. I hope this will help you a bit! I have a wood fired oven and also a steam oven, but mostly I bale in iron-cast skillet. This bread was baked in iron-cast skillet. Awesome bake! You nailed the open crumb on this one. If it was any more open you would only have the crust :). Thanks Ian! Oh, I would need to do more on the open crumb to get just the crust. I am getting better and better results.